Hi friends. Let's add some content. This is a lot longer of a process than you would think it would be and attention to detail is key - especially with the button links and tags. Each one of these gives you different pieces of the puzzle. Squarespace obviously gives you access to create the items in SS. Resources Front End gives you access to the item Description and wether it's available in Connections or not. 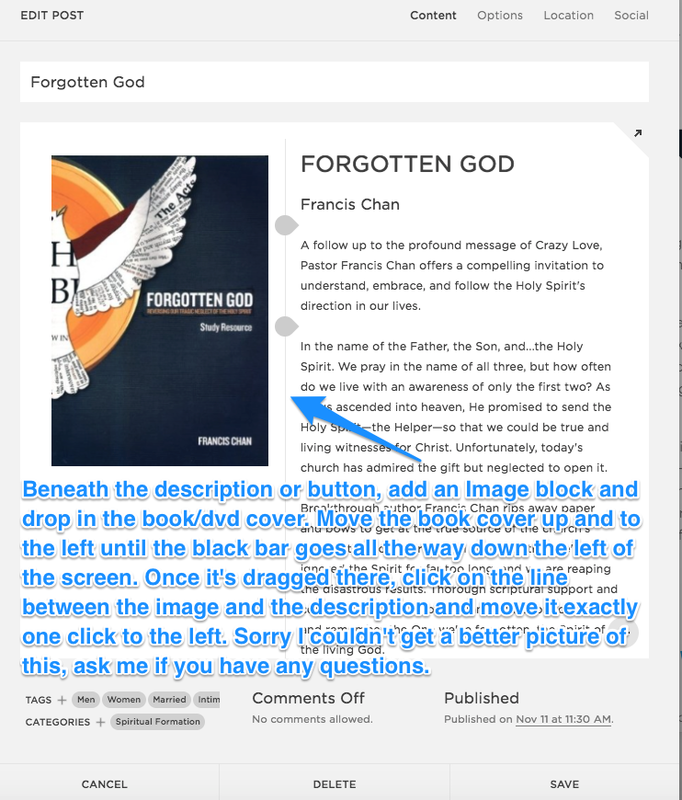 Unfortunately you can't steal the book cover from the front end so you have to use the backend. In the Back End you'll search for the item, Edit it and drag the image to a folder or your desktop. You can easily grab the "Link" url which goes into the "Get It Now" button, and the "Also Link" which accounts for any PDFs or additional materials associated with the item. When pasting, be sure to use Shift+Cmd+V as this removes any special formatting that may have been copied. The "Category" in SS will be whatever is checked in the "Topic" section of the Resources Back End. However, we're also adding the Topic to the Tags as well - so add EVERYTHING that is checked in the Resources Back End as a Tag in SS, including the Topic. The only funky one is Homework which I've labeled Homework - Some, Homework - Lots, Homework - None. Click the pic to enlarge and read all the nonsense I wrote here. Clickthrough URL always opens in a new window! If you aren't sure about your image alignment, close out of the blog creation window and check the way yours looks vs. the way another one that's already been created looks. UPDATE! I used Cloud App to record a choppy video of this process. It may or may not help but here it is. Now you'll need to click the "Options" tab at the top of the post menu. Now check it off of your sheet and start over from Step 2. You're awesome - thanks!